Happy Monday, everyone! I was able to shoot so much content this weekend and I'm super excited to share it all on the blog!! Since Thanksgiving is coming up next week, I figured I'd share three looks that are easy to recreate for the holiday. Enjoy! Look #1: I love this look, I'm probably going to recreate it for the Christmas season with some red lips and green earrings. It's a simple look that gives you so many opportunities to add your favorite details. I chose to pair it with some light pink earrings and a fedora, which I completely forget to grab for the pictures..
Look #2: This look is so cozy! There's a 99% chance I'll choose this look to wear on Thanksgiving, lol. Personally I think a dress is the best Thanksgiving day attire, I mean it allows that food baby to breath after pigging out, am I right? This poncho is also my favorite thing, ever! It's so soft and cozy and I love how perfectly it paired with this sweater dress. Look #3: This look is simple, but fun! 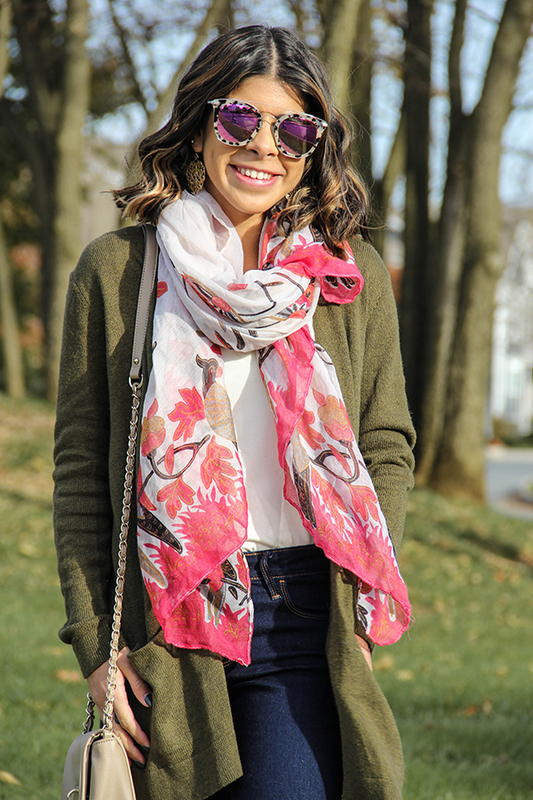 It can be easily recreating just by pairing your favorite sweater with a fun fall scarf. This makes a perfect everyday fall look, but also something great for the holidays! These cardigans are also the comfiest! !